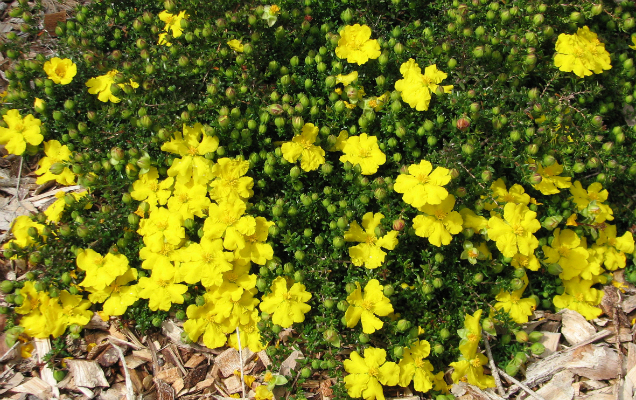 Hibbertia pedunculata “Boomers” is a low, usually prostrate shrub and forms a hardy, long-lived specimen in cultivation. It may spread to 60 cm and occasional erect stems may reach 20 cm, but it is generally prostrate. Most flowers appear in spring and summer but spot flowers can occur throughout the year. “Boomers” is an excellent small ground cover, with a brilliant booming display of bright yellow flowers held on dense green foliage. It is a highly adaptable species mass flowering from late autumn to mid spring, a great durable plant for a tough dry spot. Bees and butterflies find this wonderful plant hard to resist and congregate en masse though out the flowering season. It looks terrific planted out as a border plant or as a mass planting to create a swathe of bright yellow, livening up any garden. “Boomers” grows and flowers best in a well drained soil in a full sun to part shade position. If the soil is poorly drained a raised garden bed is recommended. Alternatively “Boomers” makes a great pots specimen, using a premium Australian native potting mix. “Boomers” is a very hardy little plant tolerating extended dry periods and frosty conditions. After establishment in the ground “Boomers” requires no extra watering.